4Media iPod to Mac Transfer makes it easy to transfer iPod music, photos, ringtone, eBook, PDF, videos and even pictures and videos shot by iPhone and iTouch to Mac. You can also transfer apps between Mac and iPod, even manage documents for some apps. Moreover, you can freely transfer multimedia files from iPod to iTunes, from Mac to iPod. The latest iTunes 12 is supported now. With this iPod transfer for Mac, you can create, edit and delete iPod playlists, connect multiple iOS devices at the same time to transfer files among them. What's more, the program can also work as an iPhone multimedia file manager to transfer video/audio files between iPhone and Mac. 4Media iPod to Mac Transfer even enables you to use iPhone as a portable hard disk and the quick search and filter tools can help you hit what you want as easily as iTunes does. Just free download the trial now. This iPod to Mac Transfer can perfectly manage any iPod/iPhone/iPad models, including: iPad, iPad 2, iPad 3, iPad 4, iPad mini, iPad mini 2, iPad mini 3, iPad mini 4, iPad Air, iPad Air 2, iPad Pro (12.9/9.7/10.5 inch), iPod, nano (5th Gen), iPod mini, iPod shuffle, iPod classic, iPod touch, iPod touch 4, iPod touch 5, iPod touch 6, iPhone, iPhone 3G/3GS, iPhone 4, iPhone 5/5S/5C/SE, iPhone 6/6 Plus, iPhone 6S/6S Plus, iPhone 7/7 Plus, iPhone 8/8 Plus, iPhone X, iPhone XS, iPhone XS Max, iPhone XR. iOS 11 and iTunes 12 are now supported. Provide solid backup for iPod/iPhone apps, music, movies and photos from device to Mac. It is also possible to read and export videos/photos recorded by device to Mac. Browsing option is now available in List view- organizes music content into Genres, Artists, Albums, Composers, and Groupings column you can choose which option to display. View your music playlist in Thumbnail view, you can even choose the image from your computer to put it as a thumbnail image and apply it to whole genera or album or playlist. You might build up a long list of playlists, with many songs in common. It's easy to lose track of which songs you've put on which playlists. To avoid duplicates, you can check a song and see which playlists it's already on or see all of the playlists the song belongs to. Transfer apps, music, movie and photo from local folder on Mac to iPod, and copy music, movie to iPhone. 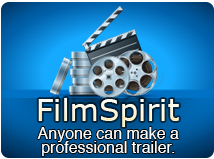 Fast and easily transfer iPod/iPhone music and movie to iTunes in just one click for further usage. The iPod to Mac Transfer supports connecting and managing multiple iOS devices at the same time. You can directly exchange files among them to share music and movie by drag-and-drop. No matter what model your iPod touch, iPod classic, iPod nano, iPod shuffle , iPhone is, you can manage it with the Mac iPod transfer tool effortlessly. Install 4Media iPod to Mac Transfer on your iPhone, then you can open iPhone with finder and use it as a portable hard disk. Auto detect iPod/iPhone model and display the device info on the program's interface, including picture, type, capacity, version, etc. Create, delete and edit playlist to classify your iPod movies and music for quick access. Transfer, rename or delete iPhone ringtones and PDF or EPUB books with ease. Conveniently manage iPod pictures into the photo albums which you can create, rename and delete at will. Especially share one photo with multiple albums without any limitation. You can check detailed info of your music, movie and photo, and edit music ID3 tag to better classify and manage your music with this iPod to Mac transfer. 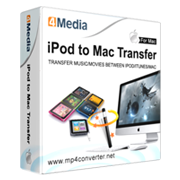 4Media iPod to Mac Transfer offers list and thumbnail modes for you to view the files, and allows you to set personalized illustration for music and movies in thumbnail mode. With the Quick Search and Filter functions, you can find the music, movie or photo file you want as quickly as possible. The iPod transfer for Mac enables you to comment on the iPod/iPhone files with different ratings to manage them more conveniently. iTunes-like interface and detail design make this iPod to Mac transfer so easy a program. All file transfer from iPod to Mac, iPod to iTunes and Mac to iPod will be finished in a breeze.